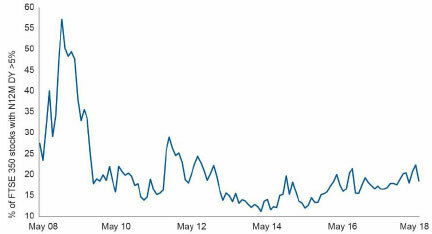 In a recent note upgrading the UK equity market to overweight, Morgan Stanley, the US investment bank, highlighted the relatively large number of stocks yielding more than 5%. With ‘search for yield’ competing as one of the most overused phrases of that period, how can we make sense of this statistic and does it represent a big investment opportunity? With so many high yielders, the UK market yield relative to the rest of the world's equity markets is higher than at almost any time in the last 15 years. One way we can make sense of this is that UK equities are very out of favour with investors, as confirmed by a recent Bank of America/ ML Fund Manager Survey. 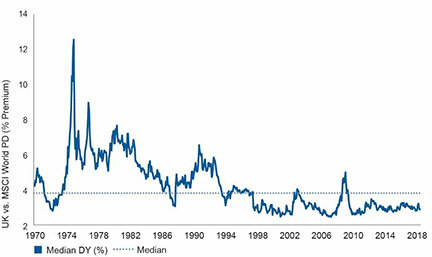 Even in absolute terms the UK dividend yield is fairly high relative to the last 20 years. When we talk about the UK market it is important to remember it is dominated by a small number of stocks. For example, the largest 10 companies in the FTSE All-Share represent over 37% of the index. The statement about the market yield above is very much a statement about these largest companies. 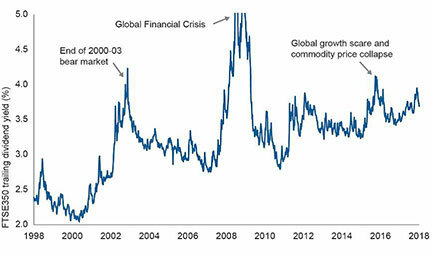 Yes, the UK market’s yield is high relative to the market. Or perhaps the rest of the world (for which read the US in particular) is low relative to the UK. The trade may be more attractive on a relative basis (the UK is preferable to the US) than an absolute basis (buy the UK). A number of UK companies with high yields are very reliant on factors outside their control, whether it be various commodity prices, political interference, house prices, the future of cigarette smoking or the levels of bond and equity markets. There is no doubt that, as we have written about before, some companies over-distribute, most probably because their advisers have informed them that their shareholders would not welcome a dividend cut. However, paying an unsustainable dividend for too long can harm a company, especially if a consequence is that it is not in a position to invest as much as it should in its business or if it keeps debt too high. Dividends should not necessarily be aresidual payment after everything else has been taken care of, but neither should it be unquestionably baked in the cake. 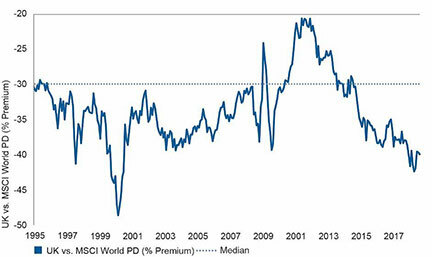 The median dividend yield of the UK market takes some shine off the claim that the UK market is cheap. Perhaps the conclusion is that there are a few more outliers than normal. The current challenge is to decide whether those outliers offer great value or are over-distributing. Where MSCI data is shown, source: MSCI. MSCI makes no express or implied warranties or representations and shall have no liability whatsoever with respect to any MSCI data contained herein. The MSCI data may not be further redistributed or used as a basis for other indices or any securities or financial products. This report is not approved, endorsed, reviewed or produced by MSCI. None of the MSCI data is intended to constitute investment advice or a recommendation to make (or refrain from making) any kind of investment decision and may not be relied on as such. All rights reserved. Issued by Investec Asset Management, issued May 2018.